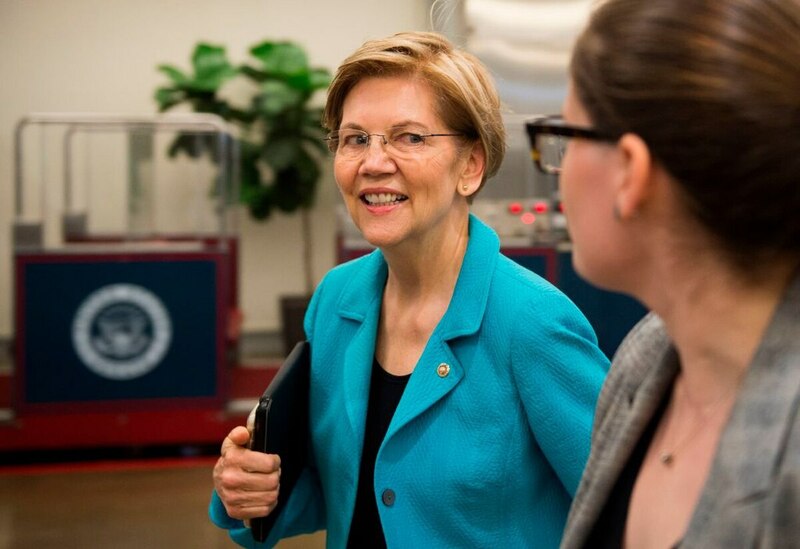 WASHINGTON — Sen. Elizabeth Warren, an advocate of reining in America’s military budget and commitments around the globe, on Monday took the first major step toward launching a widely anticipated campaign for the presidency. While Warren’s banking her reputation as a populist fighter can help her navigate a Democratic field that could include nearly two dozen candidates, she has also boosted her global affairs and national security credentials in recent years, in part by joining the Senate Armed Services Committee. The announcement comes weeks after Warren made a foreign policy speech at American University calling for a smaller defense budget, a pullout of U.S. troops from Afghanistan and a “no first use” nuclear weapons policy. By linking her foreign policy with her left leaning economic views, Warren may win over liberal primary voters, but it’s unclear how this will play with moderate voters concerned with terrorism and actions by Russia and China. Warren has championed defense spending in her home state, but she used the speech to condemn America’s “bloated defense budget,” saying it’s time to end “the stranglehold of … the so-called Big Five defense contractors” as evidenced by President Donald Trump’s friendliness toward Saudi Arabia and its war in Yemen. Where to cut? Warren has called for no new nuclear weapons, extending the New START Treaty through 2026 and a no-first-use policy for nuclear weapons. When Trump is undermining arms control agreements, she said, the U.S. “should not spend over a trillion dollars to modernize our nuclear arsenal." Warren burst onto the national scene a decade ago during the financial crisis with calls for greater consumer protections. She quickly became one of the party’s more prominent liberals, even as she sometimes fought with Obama administration officials over their response to the market turmoil. Now, as a likely presidential contender, she is making an appeal to the party’s base. Her video did not touch on foreign policy or national security, but noted the economic challenges facing people of color and showed images of a women’s march and Warren’s participation at an LGBT event. Warren is the most prominent Democrat yet to make a move toward a presidential bid and has long been a favorite target for Trump, particularly amid controversy over her claims of Native American heritage. Sanders, the ranking member of the Senate Budget Committee, has a history of challenging Pentagon spending, particularly the use of overseas contingency operations funding to skirt statutory budget caps. Hosting Defense Secretary Jim Mattis and Pentagon Comptroller David Norquist at the panel in March, Sanders questioned the massive compensation packages of top defense contractor CEOs and demanded that the Pentagon end its waste and abuse of taxpayer funds following years of reports of fraud and mismanagement. Warren has the benefit of higher name recognition than many others in the Democratic mix for 2020, thanks to her years as a prominent critic of Wall Street; she also originally conceived of what became the government’s Consumer Financial Protection Bureau. She now faces an arduous battle to raise money and capture Democratic primary voters’ attention before Iowa casts its first vote, which is more than a year away. She has an advantage in the $12.5 million left over from her 2018 re-election campaign that she could use for a presidential run. Warren’s campaign is likely to revolve around the same theme she’s woven into speeches and policy proposals in recent years: battling special interests and paying mind to the nexus between racial and economic inequities.